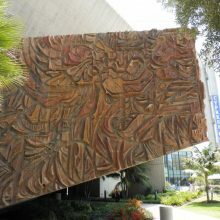 Sergio O’Cadiz (1934-2002) was a Mexican-born Orange County artist and architect who created numerous paintings and murals, as well as a number of cast concrete works employing foam forms, which were sandblasted off after the concrete dried. 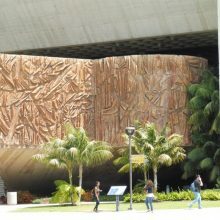 In 1967 he was asked to incorporate a cast concrete relief into the exterior walls of a lecture hall located at at Cypress College. EverGreene was brought on in 2015 to conserve and clean the structure. Our team of conservators performed conditions assessments, created mapping diagrams, performed environmental monitoring, and developed and executed treatment plans. 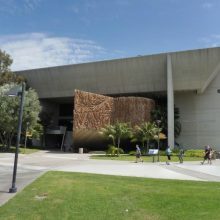 They found that many intrinsic characteristics had contributed to deterioration of the structure, including how it had been integrated into the architecture and drainage concerns. The wide variety of shapes in high relief created myriad opportunities for soil and atmospheric pollution to be retained, and variable weathering of thick and thin surfaces. We saw that if the foam forms were sandblasted off after casting, the abrasive media would have affected the concrete surface, rendering it more permeable and susceptible to moisture penetration. 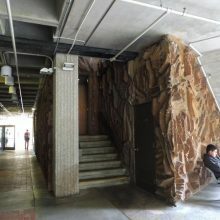 The study enabled EverGreene’s craftsmen to clean, restore and protect as much of the original work as possible, rendering the sculpted forms more legible and the stained concrete consistant with the artist’s original intent.